Including a unit on the “historical Jew” within a broader historical survey course is a vehicle for bringing historiography, historical methodology, contemporary views of identity construction, and the complex roots of cross-cultural conflict into an undergraduate classroom. 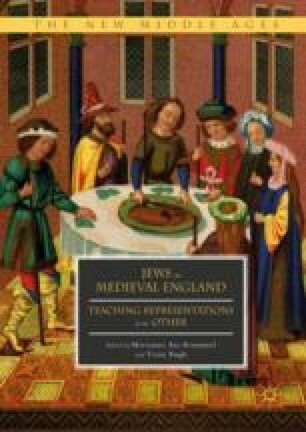 Productive challenges inevitably arise in creating a unit that focuses on the shifting relationship between Jews and Christians in medieval England and considers the reality of cross-cultural conflict. The content of this course may vary, but the basic approach encourages the critical examination of primary sources and images related to Jews that were produced in medieval England. This chapter introduces ways to pair primary sources with secondary source readings that contextualize the material and demonstrate current approaches to the questions raised.